Another year is over, which is always an exciting time at BlueFuego. It means another year of Facebook research gets wrapped up, and we get to pull out all the best nuggets to share with our clients. It’s always encouraging to see schools that we’ve worked with in the past year take our recommendations, apply them to their content, and succeed. One client went from 10th worst in the nation in 2010 to 3rd best in 2011 by simply by listening to what the data and their audience was telling them. Another client moved their engagement from the 66th percentile in the nation to 11th. The #1 school in the nation this year wasn’t even in the Top 200 last year. And nearly every other client moved among the top 10% in the nation. What’s the biggest barrier to engaging your audience, time and time again? You post too much. We’ve been saying it for nearly 3 years now, at conferences, in meetings, on phone calls. Some schools listen, others opt to continue on the path they are on. I just had to share this data point publicly when Joe sent it over to me. It’s fascinating. In 2010, Joe manually looked at 244,738 posts across higher ed Facebook pages and calculated the engagement on each of them. 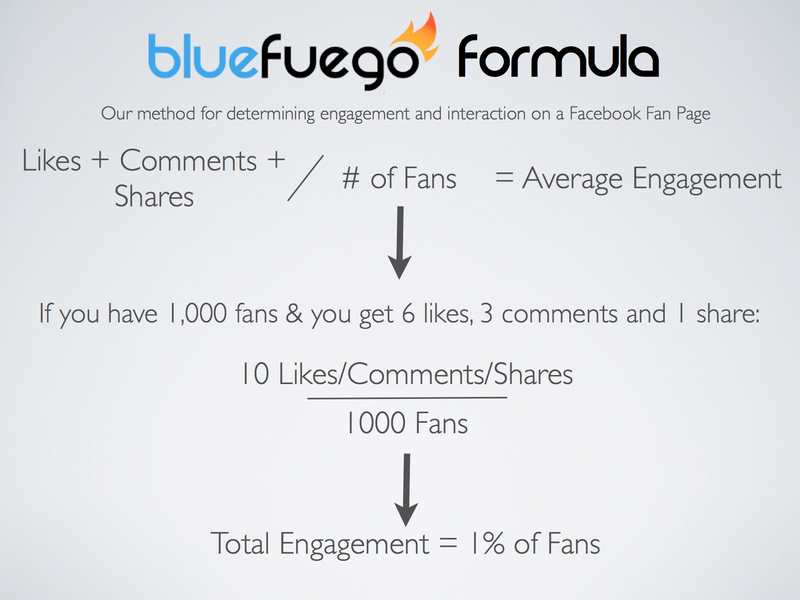 When we took engagement (using the BlueFuego Formula) and compared it to the # of posts each school was putting out per month, we saw a very strong correlation. Simply, the more you post, the lower your average engagement will be. The 10 most engaging pages in the nation averaged 14.8 updates per month to their audience. The 10 least engaging pages in the nation averaged 57.8 updates per month. Schools in the middle 50th percentile averaged 28.3 updates per month. Fast forward to 2011. 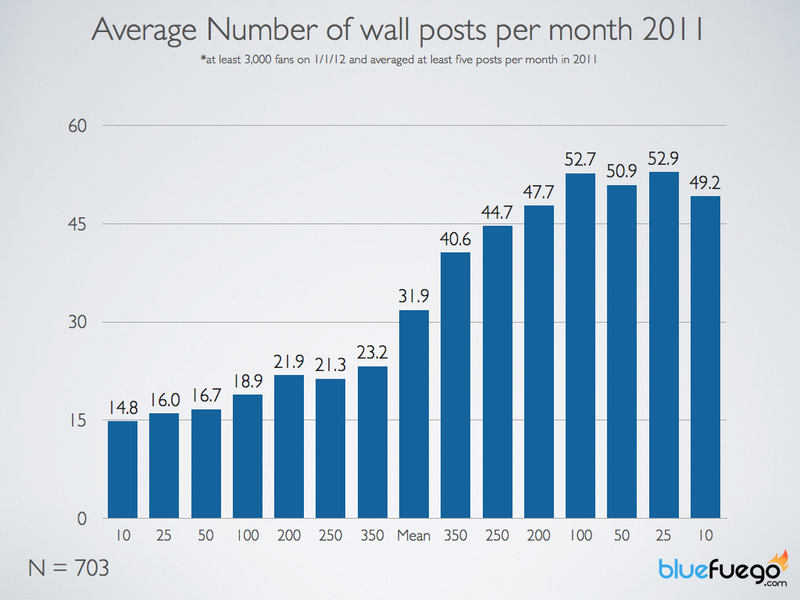 Using the same data set of schools, Joe looked at 335,955 wall posts in 2011. So the amount of content shared via Facebook Pages increased by 37.3% in 2011.Of the 10 Most Engaging Pages in 2010, only one remained in the Top 10 for 2011. Siena College moved from #10 to #6, and the other 9 schools are newcomers to the top rankings. 90% of the schools in the top 10 are gone, but the number remains. And if you look across the graph, although the N has increased by 40%, it remains very consistent. And has for nearly 3 years now. But there is one change that stands out to me. On average, the Top 100 Pages in the nation decreased their posts to 18.9 updates per month in 2011, compared to 20.2 in 2010. On average, the Pages sitting in the middle 25-75th percentile increased their posts in 2011 compared to 2010. Mediocre Pages produce mediocre content, which delivers mediocre results. Don’t waste your opportunity to build long-term relationships with your audience because you want to promote that violinist on campus tonight. Stop sharing links to press releases no one cares about. Learn what content your audience wants and deliver. Recent Facebook changes have made it harder than ever to break through the clutter, and without good content, without using EdgeRank to your advantage, you’re going to continue on the same path of mediocrity. Stand up, be bold, and make some changes in 2012! The key lesson here is to learn what your audience responds to and give it to them. While frequency of posting probably has some impact on engagement, it pales in comparison to the fit between the content and your audience. Most people won’t object to more of what they’re interested in, but you will lose their attention if you’re bombarding them with content that reflects your priorities more than theirs. Simply posting less frequently is not going to solve your engagement problems. True to an extent. When I look at a school and they have 30 posts a month, I benchmark against this graph. If they are in the 50th percentile range, I know their content is lining up with the audience. If it’s lower 10th percentile it tells me they are 1) posting too much, and 2) posting the wrong content for their audience. However, I don’t agree that simply posting the “right content” gives you the green light to post 20-30+ times a month. Frequency trumps content on Facebook pages, as shown by Joe looking at nearly 1MM posts in the past 3 years. There has yet to be a high-frequency institution succeed with high engagement as well. Low frequency + great content is the right formula. Low frequency + the wrong content doesn’t work just as high frequency + targeted content doesn’t work. It’s up to the institution to find that balance! If you are coming up with 20-30 things to post a month, it might be good content, but it’s certainly not the best. The low frequency + great content formula forces you to pick the absolutely best, most engaging content for posting on Facebook. And yes, you’ll have to say “no” to a lot of people. It can be hard to stand your ground, especially in higher ed, but nobody can argue with the results. ^^^ You say that like you run the only page in the nation that’s been Top 10 two years in a row?! Saying NO is the hardest part for most administrators. Good advice. Can you share who the Top 10 schools are?? We’ll have more coming in future weeks. Stay tuned! How do things like the Penn State scandal figure into the engagement numbers? They have mad activity on their facebook page, but from what I gather, did not crack the top ten. 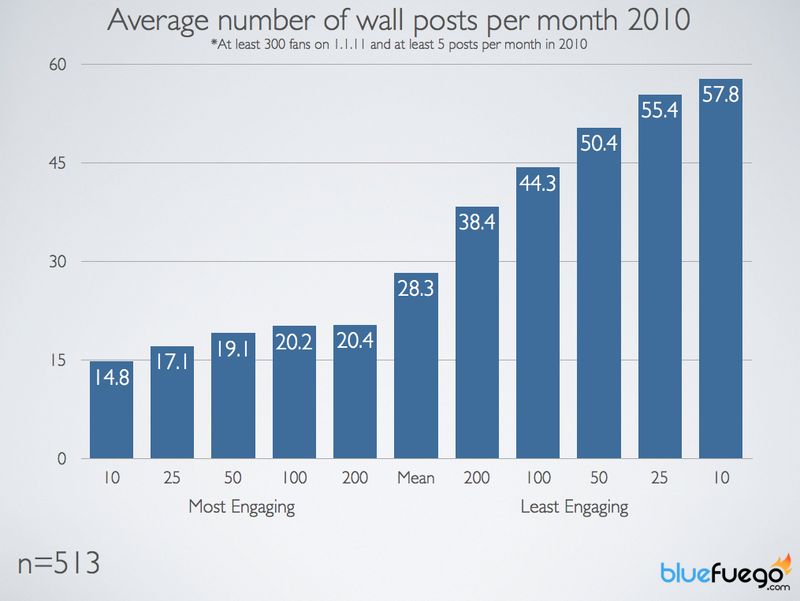 @Zoe – Most of that activity is outside of most of their wall posts (which is what we’re measuring here). A lot of people are writing on their wall but when they post, it’s largely ignored. They’ve posted 4 times in the last 6 hours, for a combined engagement of .009% right now. Penn State is the poorest performing page out of the Top 25 Largest Pages in the nation. They average well over 100 posts a month, and average engagement typically hovers around .005-.010%. Lots of content. Official #’s from data: 14th from bottom for engagement, 166 posts per month in 2011. Average .0580%, less than 1/20th of their audience interacts with them per post, which has been consistent for 2 years now. I think this data becomes even more intuitive when you think of a Facebook page as somewhat equivalent to a Facebook friend (posts from friends and pages pretty much look the same in the news feed). Do you want to read 3 posts a day from someone you haven’t talked to since college? Do you even want to read 3 posts a day every day from your best friend in the world? It’s also important to keep EdgeRank in mind. If you overpost, you could be hurting your EdgeRank score (which I’m pretty sure incorporates some measure of engagement as part of its formula), meaning your posts may never even show up in a user’s news feed. Do you look at community colleges too?